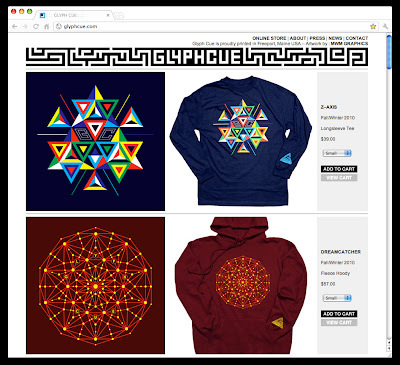 MWM NEWS BLOG: Glyph Cue : New Website. Glyph Cue : New Website. As we prepared to launch our 4th season here at GLYPH CUE it became clear to me that a web revamp was in order. I redesigned the overall architecture of the site, pulled a few all nighters, did some MacGyver style photo shoots, and wrestled with a bit of code syntax. Always fun. The new site does it's job very efficiently. With only three pages it's impossible to get lost, and the garments and graphics are showcased front row. We hope you enjoy our new F/W 2010 offering. Thanks for your continued support!